That’s why we’ve got you (and your loved ones) covered with our 10-Unit General Purpose First Aid Kit. This kit is incredibly handy both at home and in the wild. 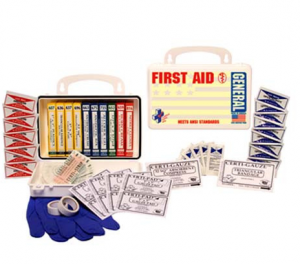 When you think about it, and all the randomness and curveballs life throws at you, you really can’t afford to not have one of these first-aid kits around. This entry was posted in Bushcraft, Emergency Preparedness, Outdoor Survival, Self Defense and tagged DIY, DIY Survival, guns, survival food on March 14, 2016 by Survival Frog. I love all the detailed instructions you provide! Easy to follow and a lot of the items needed are usually things we already have around the house. The dart gun for instance. I’ve already made mine ! So easy and it works great! I am a woman in my 50’s, if i can do it anyone can. I’ve built many of the projects you have supplied.